Simple, Scientific Construction For Young Builders! Models include a seesaw, spinning top, raft and more! Kids experience pulleys, levers, gears and wheels and axles. While playing they also learn about energy, buoyancy and balance. The set is designed for use by teams of 2 or 3 children. 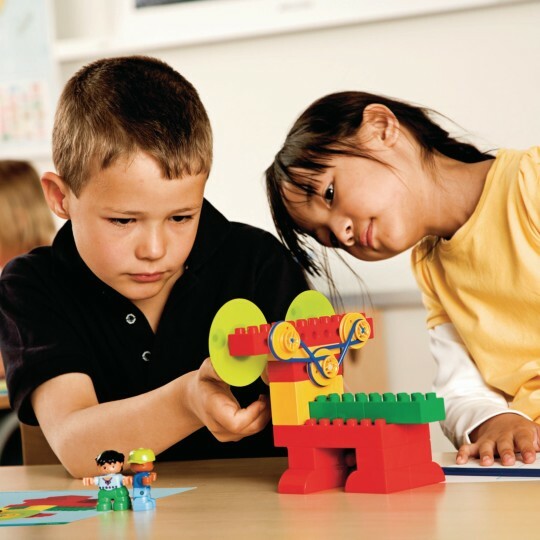 Young builders construct fun, simple models like a seesaw, rolling vehicle, spinning top, raft and many more! 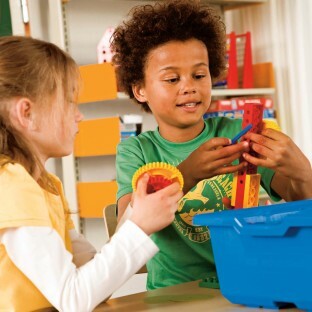 As they play with and manipulate the models, they experience pulleys, levers, gears and wheels and axles. They also pick up science exposure to energy, buoyancy and balance. The set is designed for use by teams of 2 or 3 children. It includes full-color activity cards with pictorial instructions for 8 models, a plastic punch-out sheet with eyes, sails, scales and wings, plus a plastic bin for easy cleanup and storage. Ages 5 and up.